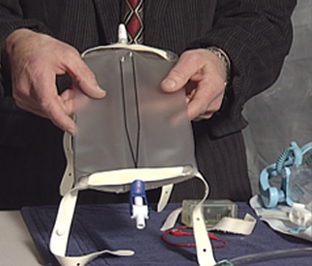 The iBag is the latest in smart urine bags. Created by Future Path Medical, this device has received FDA regulatory approval for its wireless capabilities. iBag™ combines a low-cost fluid sensor with an optional thermistor-based catheter, software and wireless communications providing urine monitoring. In addition, iBag™ will contribute to reduced urine spills and potentially with caregiver assistance – no urine backup in the patient. The intelligent design in iBag™ also provides an early warning of bladder temperature increase that can serve as an early indicator for infections. Future Path Medical’s iBag™ was invented to increase both patient and caregiver confidence and independence. iBag™ promises to revolutionize urine monitoring and management in the home. "I've thought of that, too. In every diaper there is a fine copper wire. When that becomes wet a delicate current is sent - you understand I mean an electrical current, not a watery one...". From Future Path Medical via MedGadget.